There are some problems with lower tiles. 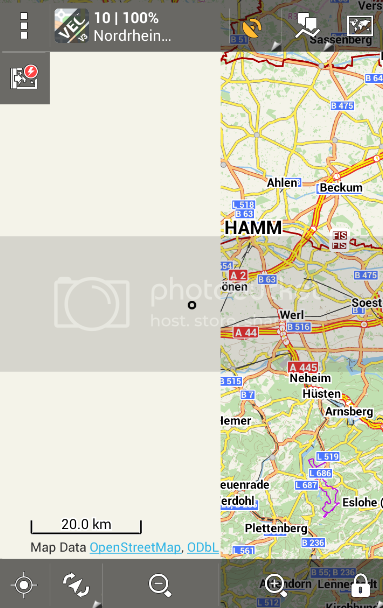 P.e.look at Northrhine Westphalia map in zoom level 11 or lower. Am I the only one who is experiencing super slow loading times with the latest map of Germany from the locus store? All other vector maps (freizeitkarte, open andro maps) work fine and load a lot faster. I am using the same theme (locus hiking theme). are we talking about map from Locus Store 2014.11.10, latest Locus 3.5.2 and any internal theme? thanks balloni, it's same issue in all cases. We have increased size of tiles in new vector maps to 512x512 and seems they are in rare cases, too big to fit to available memory. I've increased memory limit on 4.0+ devices, so it will work for them in next version. 2.x devices, there is unfortunately no simple solution for now. sometimes i get no screen for "center new loaded map", see video map change "Badenwurttemberg /Bayern"
would you please check the GPS coordinates where are you centered? I mean... are you somewhere inside the Bayern? Anyway I guess that it'll same issue as mentioned missing tiles? check the GPS coordinates where are you centered? I think this will be little bit different problem. Probably caused by incorrect check of bounding boxes of vector maps. Not so easy to fix now. I needs from Peter to update some special metadata in vector maps itself to improve this issue also. Hope it is not a big problem now. Zoom in should fix this right? Zoom in should fix this right? perhaps i found one reason, hillshademap < ZL 9 couvers most area and also center of Badenwürttemberg, and so locus see no need to center Bayern?